"... Do you want your child to be burned for a witch? 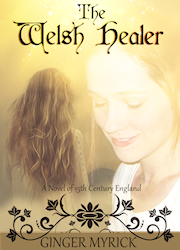 If someone should catch her at it, they will cry witchcraft and claim she is consorting with the devil ..."
The Welsh Healer: A Novel of 15th Century England tells the compelling story of a young woman growing up in the midst of the Hundred Years’ War. Spanning the reigns of Richard II, Henry IV, and Henry V, it touches upon historical events including the Welsh rebellion, the English army's invasion of France, and their triumph at Agincourt. Arlais is the gentle and free-spirited daughter of a humble Welsh household. Though just managing to scrape out a living in the rugged hills of northern Wales, her loving environment and strong family ties make for a happy home. But there is more to her than meets the eye. She is endowed with a mystical gift passed down through an ancient line of healers. She has been told her entire life that she is the fulfillment of a prophecy and destined to preserve the bloodline of kings. But despite the wondrous expectations for her future, she is content to wait for her intended mate, a mysterious man seen in a dream on her tenth birthday. But the Welsh rebellion strikes and turns her world upside down. Arlais is forced to journey across the whole of Britain to live with a distant relative. While the events foretold by the prophecy unfold around her, she settles into the unfamiliar country continuing her path toward fulfilling her destiny and experiencing companionship, heartache, and even love along the way.